During this week's state Republican Party convention, various speakers took turns praising President Donald Trump. But the bitter race for state party chair and a debate over censures illustrated divisions among Texas Republicans. SAN ANTONIO — Texas Republicans may love Donald Trump, but they are still working out their differences with one another. That was evident here at the state GOP’s convention, a three-day marathon of presidential bear-hugging and flashes of intraparty resentments ahead of a November election where nearly every statewide official —as well as U.S. Sen. Ted Cruz — is on the ballot again. The biennial gathering, which brought close to 10,000 delegates to the Henry B. Gonzalez Convention Center, was headlined by a race for chairman that culminated in a long, bitter battle on the floor Friday afternoon. At one point in the stormy session, delegate Terry Holcomb appeared to give voice to the mounting frustrations that Cindy Asche, who was challenging Chairman James Dickey, and her supporters were damaging the party by forging forward despite the numbers being clearly stacked against them. The convention’s final day of speeches Saturday was highlighted by Cruz, no stranger to intraparty warring. But he referenced the chair race — as well as the March primaries — while pleading with Republicans to set aside their differences for November. Texas Republicans at least found common ground in their embrace of the president — a less unifying figure at the last convention, which came days after Cruz ended his bruising battle against Trump for the 2016 GOP presidential nomination. The 2018 gathering, by contrast, was overflowing with odes to the president. “Two years ago, as your Victory chair, I was proud to endorse Donald Trump for president, and today I'm proud to endorse his first year and a half in office,” added Land Commissioner George P. Bush, who remains the most openly pro-Trump member of his famous political family. 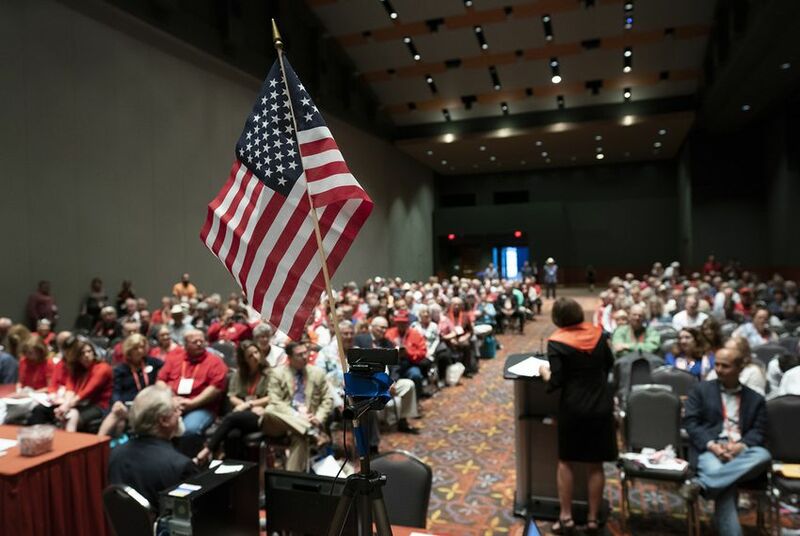 Loyalty to the president factored prominently into the chair race between Asche and Dickey, who had been a leader in Texas of the "Free the Delegates" effort to deny Trump the nomination at the 2016 national convention. Asche argued that was an impediment to growing the party to include the new voters that Trump turned out in 2016. Yet Asche came up short in the race, losing to Dickey 35 percent to 65 percent Friday on the floor after a protracted battle that the party likely will not be able to swiftly put behind itself. In her final speech to delegates, Asche revealed that the party’s longtime accounting staffer had just resigned because, in Asche’s telling, she could not trust Dickey. It was not just the chair race where lingering intraparty resentments were on display. In at least a couple of appearances at the convention, Patrick declared victory on the “bathroom bill” that he championed last year. He argued that while the measure didn't pass through the Legislature, an overwhelming majority of GOP primary voters voted for a ballot item asking if they supported protecting the privacy of women and children when they go to the bathroom. That drew a rebuke from the legislation’s biggest opponent: retiring Texas House Speaker Joe Straus. “If ‘victory’ on the bathroom bill means that it’s not coming back and there will be more focus on fixing school finance and promoting private-sector growth, that’s great news,” the San Antonio Republican said in a statement. The intraparty tensions also flared around another statewide official: Bush. He weathered a few rounds of boos during his remarks Friday — apparently from delegates still upset with his management of the Alamo, a key issue in the four-way primary he won this year. "Remember the Alamo!” some of his critics yelled. Then there was the debate over censuring Republicans in office, which began this year when the State Republican Executive Committee censured Straus. That debate intensified this week at committee hearings during the convention. Members considered proposals censuring retiring state Rep. Byron Cook of Corsicana, a top Straus ally. They also weighed similar action against several members of the state's congressional delegation, including Cornyn, over their support for omnibus spending legislation this year. Members handily rejected resolutions against the delegation members, though the censure of Cook was approved by delegates on Saturday. Texas Democrats, who are staging their own convention next weekend in Fort Worth, relished the infighting at the rival party’s gathering, sending reporters daily recaps of the drama. Texas sent its first woman to Congress in 1966. Why has she been largely forgotten?